Each kit contains silk print, instructions, picture, coloured embroidery threads, all beads and flowers. We are happy to announce the release today of a further 15 pieces of lace to our extensive range of products. The new lace can be found in both the Lace and New Products sections of the site. If you have any queries, suggestions or would like to place an order don't hesitate to contact us! 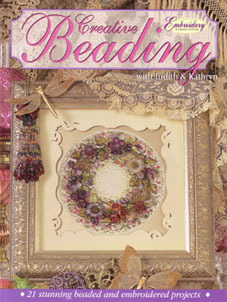 Many readers will be familiar with our new book 'Creative Beading with Judith & Kathryn' which is now available through newsagents, leading craft stores and through our website.